Wright State University is already well regarded for its traditional and weekend Master of Business Administration (MBA) programs. This fall, it adds a new option tailored for busy professionals seeking career advancement: a 100 percent online MBA degree. Applications for the inaugural fall 2015 cohort are being accepted now. The online MBA program can be completed part time over two years. Prospective students are invited to an MBA information session on Saturday, June 13, from 10 a.m. to noon in 167 Rike Hall on Wright State’s Dayton Campus. A presentation will begin at 10:30 a.m.
Attendees may speak with faculty members and learn about the three MBA options: traditional, weekend and online. No advance registration is required. A virtual M.B.A. information session is scheduled for Thursday, June 25, from 6 to 8 p.m. Join the conversation online. Those who cannot participate in either session may schedule a personal advising appointment by calling (937) 775-2437. This is not your typical online degree program, Munch said. The robust coursework is a combination of synchronous — where the instructor and students are online at the same time — and asynchronous learning — where students take the course on their own schedule. Courses are only seven weeks long. Some incorporate a live virtual classroom, where the professor and students can share desktops and use chat boxes and webcams, if they choose. Many lectures are recorded for viewing or listening at times convenient for students. “The intent is to make it as close to approximating a face-to-face experience as possible,” said Munch, who also teaches online marketing classes. Instructors can interface with their students, and students can collaborate with their classmates and teams. “It puts Wright State in a position to lead in terms of the future of graduate education and technology,” he added. Fernando Smith, managing director of online programs for the college, helped build the technology infrastructure needed for this innovative program. A consistent graphic look aids course navigation. Wright State’s new online MBA is approved by the State of Ohio and one of only a few in the region offered by an AACSB-accredited school. There were 345 students enrolled in the traditional and weekend MBA programs last year. Degree requirements include a set of core courses and concentration courses that are interdisciplinary and co-taught. For example, a marketing and supply chain coordinated course will have a marketing faculty member and a supply chain faculty member teaching the course together. 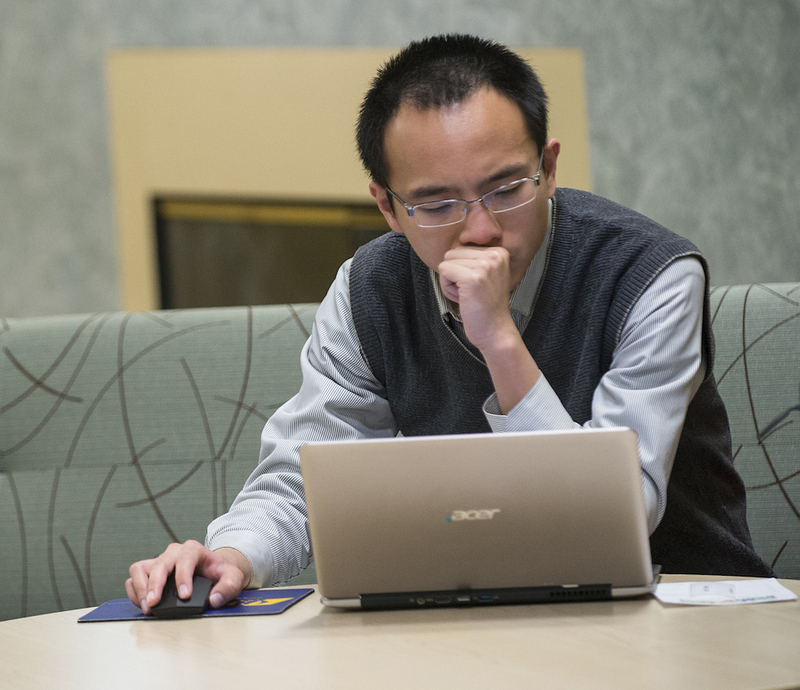 To maintain high academic standards, the same outstanding faculty who teach on Wright State’s campus will lead all online classes. They will share their global business experience and connections. “Our faculty come from the finest Ph.D. programs in the land,” Munch said. In fact, faculty members earned their Ph.D.s from Penn State, Carnegie Mellon, UMass, Maryland, Syracuse, Case Western Reserve, Indiana, Michigan State, Purdue, Florida State, Louisiana State, Arizona State, Iowa, Texas A&M, Oklahoma State and UCLA. For details and admissions requirements, visit the online MBA website. Wright State is engaged in a $150 million fundraising campaign that promises to further elevate the school’s prominence by expanding scholarships, attracting more top-flight faculty and supporting construction of state-of-the-art facilities. Led by Academy Award-winning actor Tom Hanks and Amanda Wright Lane, great grandniece of university namesakes Wilbur and Orville Wright, the campaign has raised more than $113 million so far.